1. Combine seasoning ingredients. Press 4 teaspoons onto beef steaks. Add cheese, oil and vinegar to remaining seasoning; mix well. 2. Place steaks on grid over medium, ash-covered coals. Place vegetables around steaks. Grill steaks, uncovered, 14 to 16 minutes for medium rare to medium doneness, turning occasionally. Grill bell peppers 12 to 15 minutes and onion 15 to 20 minutes or until tender, turning once. Brush vegetables with cheese mixture during last 10 minutes. 3. Carve steaks; season with salt and pepper. Serve with vegetables. 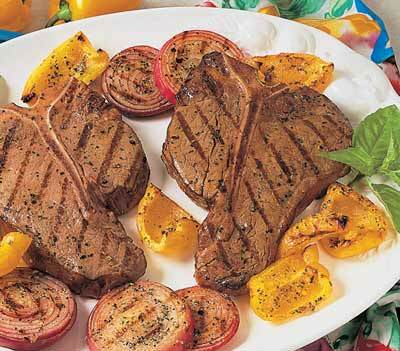 *Porterhouse steaks may be substituted for T-Bone steaks.